The national bestselling author of Booked for Trouble returns with another charming mystery set in the most literary lighthouse in North Carolina's Outer Banks. 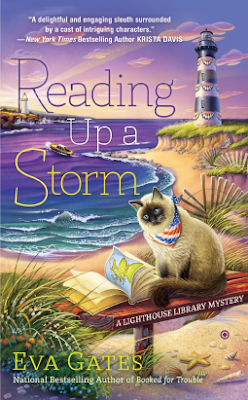 After a successful party at Bodie Island's Lighthouse Library, librarian Lucy Richardson is ready to curl up with her cat, Charles, and a good book. But her R and R is cut short when she notices some mysterious lights leading a small boat to crash into the coast. 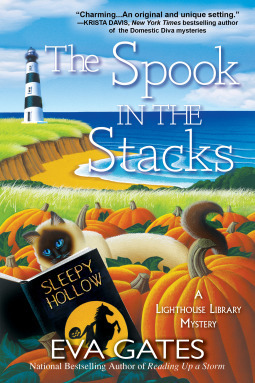 This book follows Lucy Richardson whose working at the Lighthouse Library when a new resident comes to town and ends up dead in a boat. Who killed Will and why? Was it a book seller who he was stiffing or was it his girlfriend who was so naive as to know what Will was really up to or was it someone else with a different agenda? As pressure is put on Lucy when her friend Stephanie is brought in repeatedly for questioning relating to Will and his death. Lucy is determined to figure out who killed the man and why?